The British Royal Navy's Fleet Air Arm (FAA) was interested in the Vampire from early on. The second Vampire prototype, fitted with larger flaps and air brakes, was flown beginning in May 1945 for a preliminary assessment of its suitability for carrier operations; this going well, the prototype was modified with a yoke-style arresting hook, which retracted through the exhaust flow into a fairing above the exhaust, as well as a teardrop canopy and a Goblin 2 engine, in preparation for actual carrier operations. On 3 December 1945, the "Sea Vampire" performed the very first jet carrier landings and takeoffs, with Lieutenant Commander Eric Brown performing several landings and takeoffs on the HMS OCEAN off the Isle of Wight. Although the trials went well, the FAA finally decided that the Sea Vampire wasn't what the service required for a first-line fighter, but it did seem like a cost-effective training and evaluation machine for bringing the Royal Navy up to speed in jet carrier operations, and in early 1947 a batch of "Sea Vampire F.20" machines was ordered for that purpose. The F.20 featured the larger flaps, larger airbrakes, and the arresting hook featured on the Sea Vampire demonstrator, and also added ruggedized, long-stroke landing gear plus FB.5 clipped wings. Although 30 F.20s were ordered, only 18 were actually obtained, all as modifications of Vampire F.3s or F.5s. Initial service deliveries were in October 1948. Pilots found the F.20 to be very pleasant on carrier approach, particularly with the fine view from the set-forward cockpit, but unpleasantly sluggish on takeoffs when the catapult wasn't used. The Sea Vampire F.20s were finally pulled from service in 1956 and 1957, to be scrapped in 1960. After years of basically nothing on the injected plastic Vampire front, within the space of a year we get kits in both 1/48 and 1/72 for this aircraft. 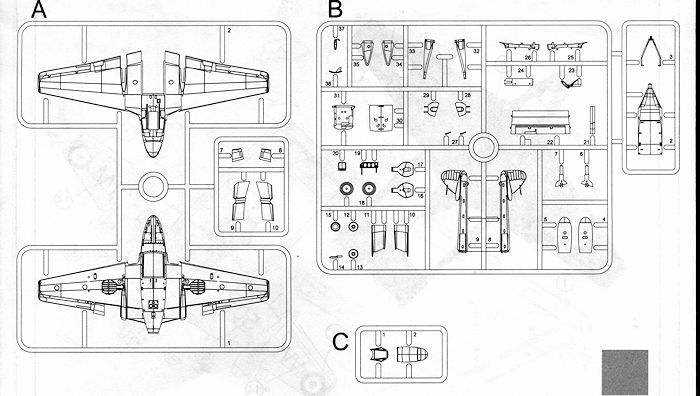 Previously in 1/72 we had the Frog and Heller kits to satiate our Vampire desires, but now Cyber-hobby has started producing the single seat versions with Airfix recently doing the two seat trainer. 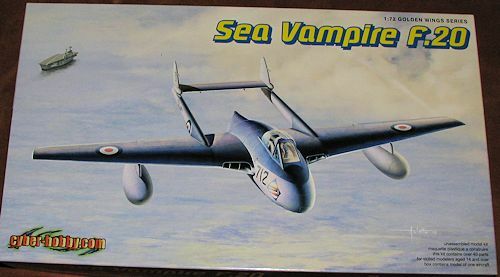 Somehow I missed out on the FB.5, but now I've a chance to scope out the Sea Vampire. To start out with, there is not a lot of plastic to this kit, which is to be expected as the Vampire was not a complex aircraft. One small bag holds the separate windscreen and canopy with another larger bag holds the two grey sprues for the rest of the aircraft. This one has inserts as you might expect, in order to do the different variants. New to this kit is the extended upper rear fuselage section and the tail hook. The 'standard' piece is not included so you are pretty well forced to do the Sea Vampire version. Three markings options are provided. All are in Extra Dark Sea Grey over Sky. One is the box art plane from 712 Squadron at RNAS Ford in 1956. The others are a relatively undecorated plane with 728 Squadron at RNAS Hal Far in 1954 and another aircraft from 771 Squadron at RNAS Ford in 1953. With only 18 planes built, this may well be the total units to have flown it! A nice model that will not take up much shelf space. 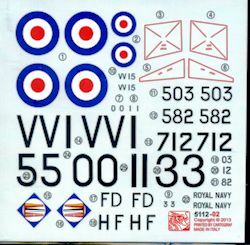 It will also be a required addition to any 1/72 FAA collection. Thanks to www.dragonmodelsusa.com for the preview kit. Get yours at your local shop today.